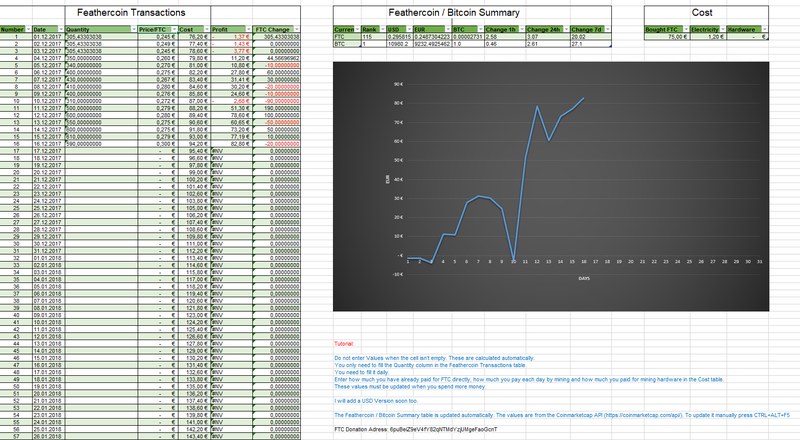 I created a profit calculator for Feathercoin using Excel. Basically it offers you a simple and easy method to keep track on how much money you spend, how much money you gained or how much money you lost. Also it is very easy to use because you only have to enter how much FTC you own. Everything else is calculated automatically. This project is also available on GitHub now. You are welcomed to make your own contributions on order to make it even better. Right now there are two versions. One for EUR and one for USD. If you want me too add another currency just leave a message.